India is a popular destination for website design and development but choosing the best service provider from thousands is indeed a challenge. We are here to simplify the task for people, businesses and freelancers/small scale companies that often search top ten/twenty web design development companies in India. FATbit is a web services brand known for its creative team of designers and custom programming expertise for past 14 years. As a creative digital agency, the company has earned several accolades and grown immensely in last few years post the success of its marketplace solutions resolutely developed for entrepreneurs who want to launch a new business based on digital commerce and seek affordable system for that. The list includes readymade portals for different industries (customizable as per business needs). It is one of the best web design companies in India with experience in catering small & large businesses with its vast range of products and services. Certainly one of the top 10 website design companies in India. BC Web Wise is a digital advertising agency known for offering strategic brand solutions and creative team of professionals. In its decade spanning existence, it has catered clients in the field of finance, consumer products, telecom, and entertainment. 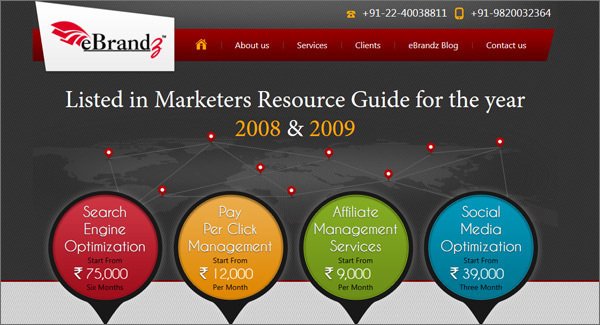 Ebrandz focuses on giving its clients SEO advantage and better brand presence. It doesn’t promise any guarantees for Google and Bing presence. It has more than 10 years of experience in the industry and offers affordable SEO packages. Its focus on affordability makes it a strong contender for a position in top 20 budget SEO companies list. 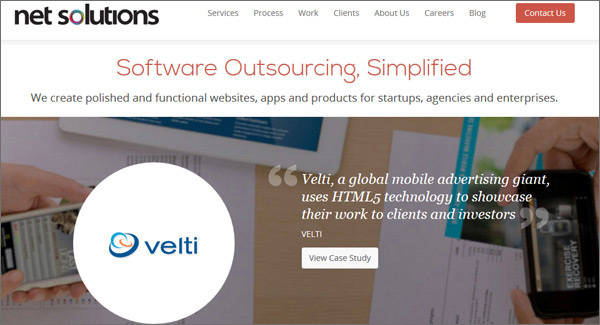 Also Read: How to Choose Best Website Design Outsourcing Firm ? Trionn Design is located in top ten investment friendly states in India. Its focus on creativity becomes clear above-the-fold itself. 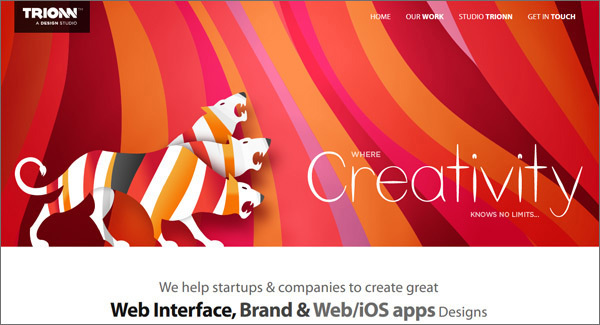 The web design agency India claims to have strong hold in web interface, and iOS app design. 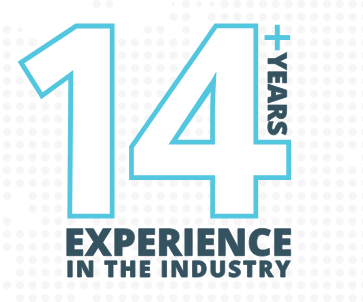 Website homepage claims to have industry experience of 15+ years. 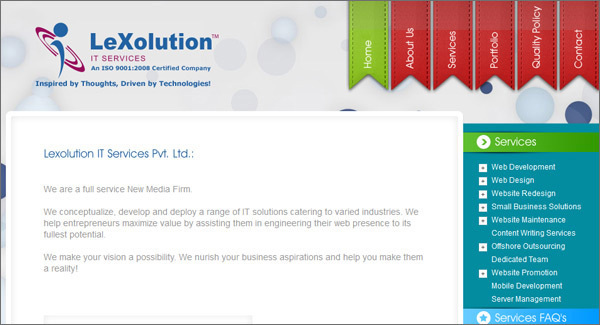 Technologies/Skills: Web design, web development, mobile application development, SaaS development. 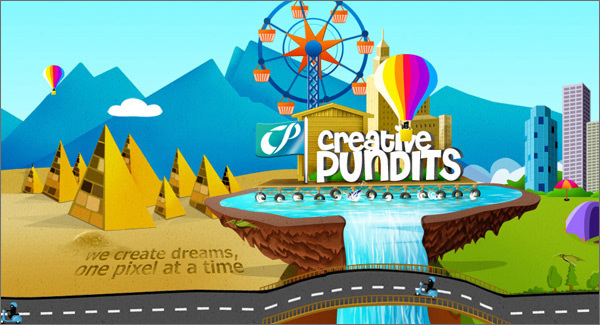 Another website design company India that focuses on creativity and makes a statement on its homepage rich with animation & graphics. It offers vast range of services and might seem appropriate if you want something rich in animation. Technologies/Skills: Web design, branding, web and mobile application development. BeardDesign is a team of young people that specializes in branding and design. The company pitches itself directly to startups and has a portfolio laden with brochure design, magazine cover design and brand identity samples. In case of poster design firms, its name might appear in India’s top hundred. The web design development company has a single-page website and specializes in design, multimedia and SEO. 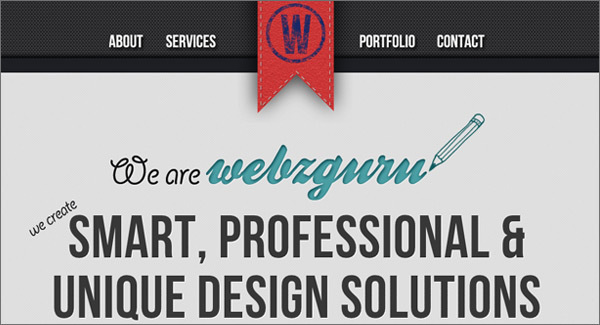 With industry experience of a decade, Webzguru has a lengthy range of website design & development services to offer. 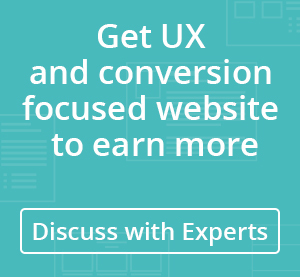 Have a Web Design & Development Work? 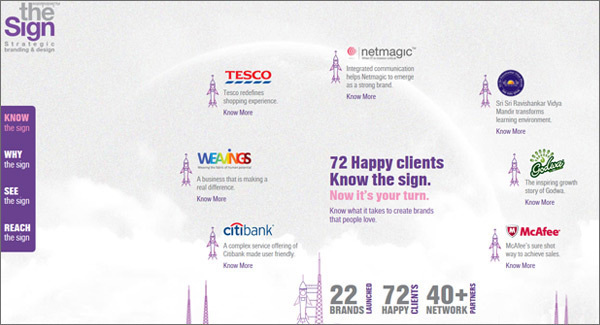 KnowTheSign claims to be expert in strategic branding and design. The homepage is rich with graphics and focuses on reflecting professionalism and industry knowhow. Worth considering if you are looking for corporate videos & branding. 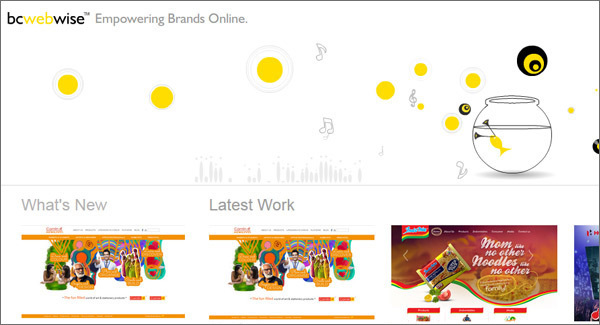 Best Web design Projects/Clients: OCF Offshore, Cipher Investments, and Little Learners Academy. 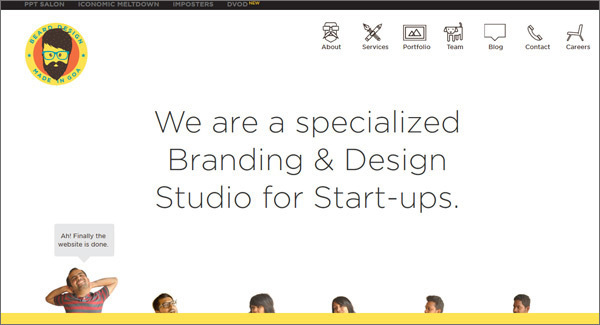 FulleStop is a web design agency India that claims to have worked with brands like Hidesign and Peugeot. Some of its most unique services revolve around corporate identity, flash animation and Java. 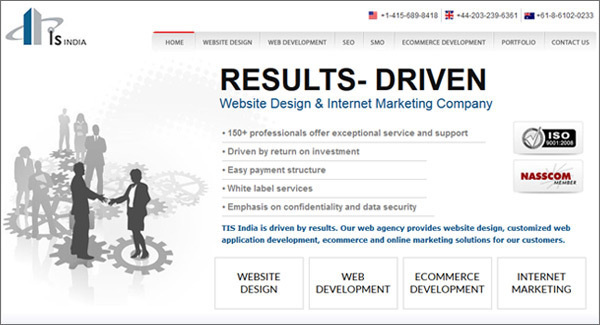 TIS India pitches itself as a web design & internet marketing company, and has been in the web services industry for more than a decade. It guarantees top 10 ranking on Google. QuarterPie is a young company with exemplary design and development work. It is well known for custom business applications related to database manipulation. The team is also approached for its WordPress expertise. Founded by 4 friends, Lexolution IT is a full service new media firm and aims to emerge as a leader in web design & development. It is also active in knowledge processing industry. You must be wondering why, being a team of Indian website designers & developers, we made you familiar with our competitors. Well, the answer to the question is that we like to face the competition head-on and want our potential clients to make an informed decision. Though we are known globally for creativity, technical expertise and affordability, we wish to make you familiar with other service providers in the Indian subcontinent. Also, we know how troublesome & confusing Google search is nowadays and how painful it is to go through irrelevant resources under the title of “best 50” or “top 100” firms. 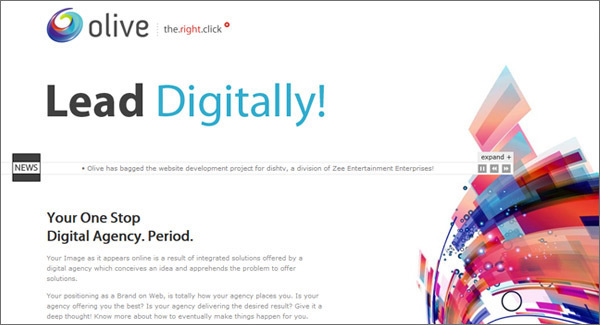 So, we thought it would be a nice to list celebrated web design agencies in India to level the ground for competition. What makes FATbit different from the rest? We use the latest and newest technology to deliver the BEST. 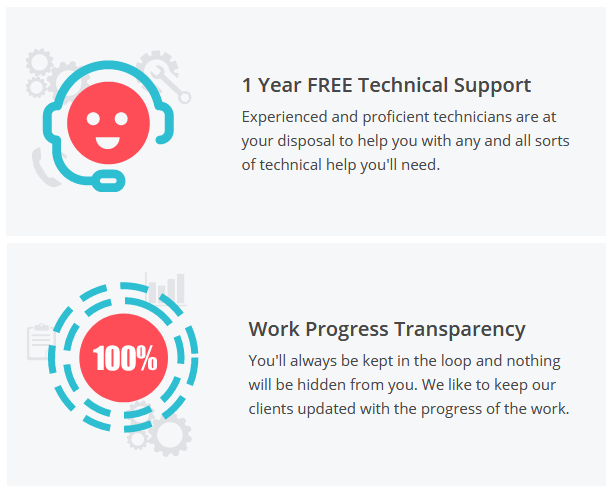 We offer one year of free technical support for bugs and errors. We offer highly distinct yet affordable solutions. We offer custom solutions to match any business idea and need. We always believe in exceeding client expectations with exceptional service. 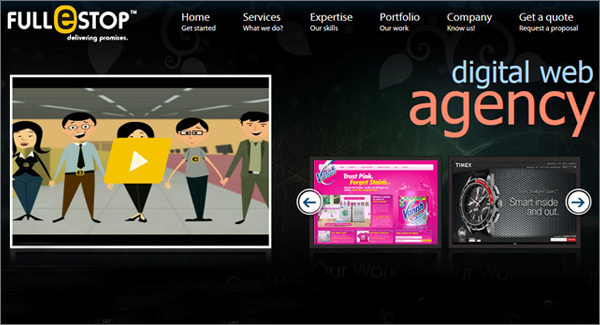 Have Any Query Related To Web Design & Development Work! If you believe any piece of information about the listed companies need to be updated, write to us at connect@fatbit.com. Also message us if you think any other Indian web design or development firm deserves a spot in this list. Posted in Design & Dev and tagged as Top web design companies, best website design companies, web design companies India by FATbit Chef. Please provide the list of your best 5 projects which are either very creative or very extensive in terms of functionality. Do not include ready script based projects unless customized. great collection, thanks for sharing ! I’m really impressed with your writing skills as smartly as with the format in your weblog. Thank you for your appreciation. We do all the research on our own and then write a blog. The way chef explained each point with necessary details and maintained good balance between theory and practice is really commendable. Keep coming back for more such content. Thanks Etta for your comment. We are glad you liked the post. Go and get your dream job. best of luck. It’s actyually a cool and helpful piece of info. I’m happy that youu shared this helpful information with us. Please keep us innformed like this. Thank you for sharing. Thanks Suzzanne for your appreciation. There are many companies who claims themselves to be the best agency but the actual comes when services offers at affordable cost, the best web development in India offers affordable web design and development services. i want make a new website. Thanks for reaching us out. One of our expert will get back to you soon. Hi, I am Anita Sharma and we want to do partnership with your company. Visit our website http://www.dakshadigitas.com. We know how important the every single second is and that’s why we turn around the clock to get your work done on time. Our team is dedicated towards the work and finishes the development on time, thus saving your time. So get connected with us. Thank you for showing interest in FATbit. I have forwarded your request to the management and will get back to you shortly on this. Thanks foe sharing this post. Much obliged. Keep coming back for more posts on Web Design and Development. I just wanted to thank you for this incredible post. It’s full of SO much good information and resources . Thanks for appreciating the post. Keep coming back for more such interesting posts. Great Post, Thank you for sharing such a impressive collection. Great Post, Thank you for sharing informative collection. We are glad you liked it. Great list, Thank you for sharing such an informative and impressive post. Great publish, very informative. Because finding a best and reliable company for outsourcing of web designing and development become a very long process. This post help a lot to all in every aspect regarding this. And moreover I am extremely impressed with your writing skills as well as with the layout of your blog. Keep it up! So happy to hear that from you, keep coming back for more posts about the web world. We can surely redesign your websites and help you in growing your business. Kindly share your requirements via https://www.fatbit.com/website-design-company/requestaquote.html and our expert will get back to you. I found lots of interesting information here on your design development blog. The post was well written. We can surely help you with the web designing work. And our expert will get back to you. Excellent post! Thanks for sharing these helpful tips with us. 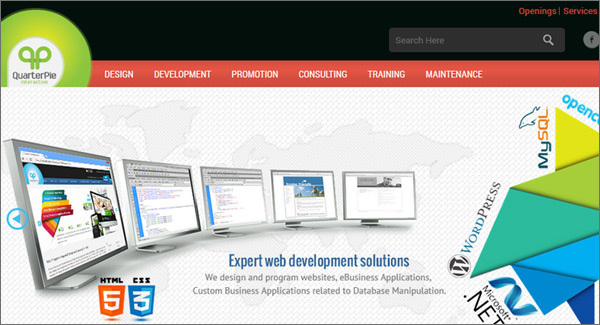 Nice to read your blog.Awesome content for web designing and development. Thanks for the appreciation Deepak! Keep coming back for more such posts. keep visiting us for more such info. I heard about some big names from the list… and came to know about few more companies here. Thanks, Jacob for the appreciation! Excellent article ! I like it . Glad you liked it.Keep visiting us for more such articles. Hey! Thanks for sharing this information – appreciate the effort you put in. You made it really awesome and cool, this guide is really helpful for new bloggers like me. you helped me a lot, so I just wanna say thanks to you. Thanks a lot for this wonderful post! We haven’t even aware about some of the concepts that you have mentioned. This a gem of an article! Thanks again for sharing. Yes, we do accept guest blog posts on FABlog. Thanks for showing interest in us. We would be glad to work on this project. Useful Content! Thanks for sharing pal. Keep coming back for more such useful content. First of all, I appreciate your team for sharing best information! I have some queries on online food ordering system. Please try to contact me. Thanx for publish this helpful article. Too much information about website Designing companies. Keep visiting us for more such knowledgeable post articles. I like your blog your blog is very interesting and informative. Yeah! You said right Great stuff here, Thanks for sharing it. Thanks for suggesting best ones. Excellent and very helpful information on this post. This is the basic and the most important feature that website should have. Following these will certainly lead towards a great website. All your mentioned points simple and easy to understand. Many many thanks for sharing this useful information.